The United States Congress designated the Currant Mountain Wilderness (map) in 1989 and it now has a total of 47,311 acres. All of this wilderness is located in Nevada and is managed by the Forest Service. The Currant Mountain Wilderness is bordered by the White Pine Range Wilderness to the north and the Red Mountain Wilderness to the east. 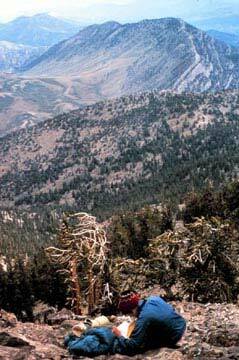 Volcanic-deposited sediments uplifted into a fault-block mountain range, now called Nevada's White Pine Range, which peaks at the 11,513-foot Currant Mountain near the center of the Wilderness. Sagebrush, pinion pine, and juniper dot the lower elevations, deferring to white fir, limber pine, and bristlecone pine higher up. Portions of the area are important to upland game birds, especially partridge, and sometimes to members of the northernmost herd of desert bighorn sheep. The southern section provides ideal habitat for raptors. Monte Cristo Wild Horse and Burro Territory extends into the western section of the area, but wild horses are not frequently seen here. Elk use the northeastern section, and mule deer are common. Extremely rugged terrain and limited access (especially from the east) make this an odds-on favorite for solitude in a Nevada Wilderness. The 10 miles or so of trail are in poor condition and receive light use. You'll find little to no water in this region. The Broom Canyon Trail enters on the western side, follows an old road for about 2.5 miles, and, although it disappears, probably provides the best access. Three acres of the Wilderness lie in the Ely District on BLM land. Planning to Visit the Currant Mountain Wilderness? How to follow the seven standard Leave No Trace principles differs in different parts of the country (desert vs. Rocky Mountains). Click on any of the principles listed below to learn more about how they apply in the Currant Mountain Wilderness.